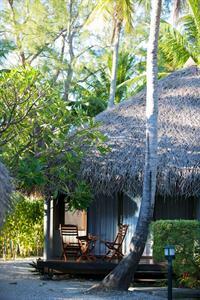 The 10 Garden Bungalows are spacious and well-equipped. Natural materials such as woven bamboo, and exotic woods are used to complete the traditional Polynesian style based on shells, pearls, and wood to create a warm and welcoming atmosphere. Located in the garden, you can admire your surroundings from the comfort of your private terrace. You will find a large bed decorated upon your arrival. Other features of the Vini Bungalows include: coffee / tea service, writing table and chair, air-conditionning, ceiling fan above the bed, safe, mini-bar, TV, international direct dial telephone, Internet access by dialing in from the room, and plenty of room to store your personal belongings. 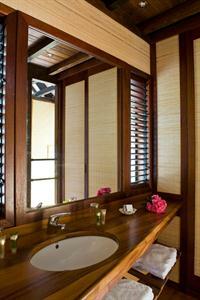 You will appreciate the spacious bathroom with shower and separate toilet. Toiletries (shampoo and soap), towels and hair dryer are provided. 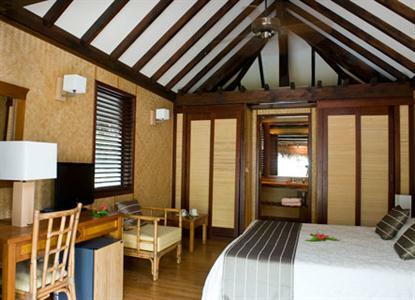 The Vini Bungalows are all equipped with air-conditioning, Internet access by wifi and maid service is provided daily. The Vini Bungalows are also equipped with an extra sofa bed that gives you more room to relax or that can accommodate a third person.